Secret Life is a classic, elegant and refined motor yacht with a rich history and excellent reputation. 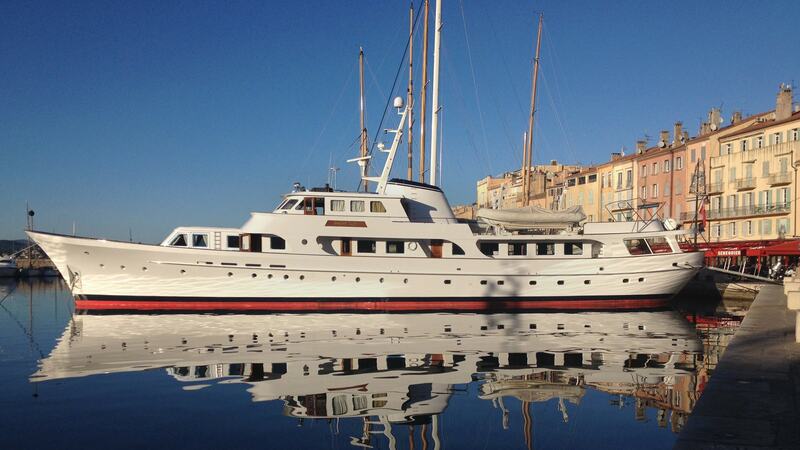 She was built by Feadship in 1974 and underwent an extensive refit in 2013. She is a seaworthy vessel, with low fuel consumption; she shows great motion at sea and great stability at anchor. Secret Life boasts vast deck spaces perfect for enjoying the Mediterranean sun, socializing and entertaining. Timeless styling, beautiful furnishings and sumptuous seating feature throughout Secret Life’s living areas to create an elegant and comfortable atmosphere. The yacht boasts vast deck spaces ideal for enjoying the Mediterranean sun or for socialising and entertaining with family and friends. Her spacious decks also make her the ideal yacht for corporate functions and events, with a capacity of up to 150 guests. Her spacious saloon with large, open windows can be divided into two separate rooms with a sliding door, which can be beneficial for event charters. The yacht also features a quiet library, and comfortable ensuite staterooms. The Master cabin has a California king bed measuring 2m and takes up full width of the beam amidship, located on the lower deck. In the master suite there is a settee that can convert into a double bed (measuring 1,40m), creating room for a 12th guest on board. The convertible settee area can be separated from the master cabin with a sliding door. The yachts VIP double cabin has a 1,60m Queen bed and is located on the main deck forward, which can also transform into a cosy salon. The triple and two twin cabins are located on the lower deck and all cabins are equipped with ensuite facilities, a fridge and LCD TV with DVD and CD player. Secret Life stands out for her fuel efficiency. With a cruising speed of 10 to 12 knots and a maximum speed of 14.2 knots she can cover a long range of 3500nm through her 70.000 litre fuel tanks. She is the perfect example of a yacht that perfectly combines performance and luxury, making her the ideal yacht for cruising the Mediterranean with no need to stop and refuel. Her professional crew of 10 will ensure all your needs are taken care of as you sit back and relax, while enjoying the Mediterranean sun. This yacht’s accommodation coupled with her welcoming crew will make your time on board this Feadship unforgettable.